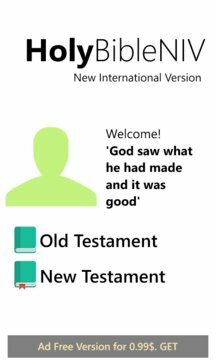 Enjoy using our NIV Holy Bible application that enables you bookmark, share, and also zoom in o zoom out font sizes. This holy bible application takes you away from the use of hard bible books and into the future where staying in holy communion/Christian family is not an option. A future where you can do so much with the word of God. With this bible you can learn to read at least one verse every day thanks to reminders and notifications. This helps you stay connected with God always. You can also share bible verses thus helping you stay connected with other servants or Christians, as we all task ourselves in evangelising the word of God. These verses can also be shared in all social media platforms. This holy bible is designed with ability to bookmark your favorite verses or even remember where you last stopped reading. 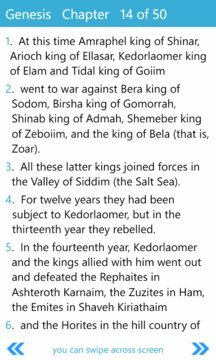 Select verses you want to bookmark. Then select bookmark icon that pops up. Choose a color you want to save bookmark with, then click save.To delete bookmarked verses, swipe to the left of the verse. To share verses, just click share icon after selecting verses. This holy bible has been designed to make reading easy. We have included zoom in and zoom out option that increases and reduces the text size of font respectively. No annoying or obtrusive advertisements. All the books of the holy bible, New International Translation, NIV, have been included. Select book, say Psalms, that you want to navigate to. Select the chapter you want to start reading from. All the verses in the chapter are loaded. After finishing reading the verses of a chapter, simply click on NEXT ARROW button at the near top right side OR SWIPE ACROSS SCREEN. We DO NOT require any data-sucking or privacy violating permissions for you to use our application. Alarm permission helps us remind you when to read the bible. NO HIDDEN personal data or downloads done. *New International Translation, NIV, other translations available on click "More Applications"
"We are on a journey to make the best bible application, join us as we take steps". Write us an email to bibleappsdev@gmail.com. We shall respond.